Trimble’s Landscape Design and Installation Division offers complete landscape services, featuring design, installation and maintenance for both private and commercial properties. We also offer expert masonry and construction services, such as unique patios, walkways, and rock wall constructions, arbors and pergolas. We’ve even built outdoor shower structures. Our projects range from sprawling estate gardens to intimate small herb and fragrance gardens. We have designed and installed elaborate gardens at local wineries as well as unique window boxes and container plantings for restaurants and small businesses. Whatever the scale, what we promise is that we will create exciting, original designs that are beautiful and ecologically sensitive. Our other specialties include: perennial borders; cottage gardens; naturalized planting areas; herb beds; hummingbird and butterfly gardens; deer-resistant and drought-tolerant plantings. Many of our projects are developed over several seasons and we think this “step planting” allows our clients to grow into their new landscape. Trimble’s strongly believes that commercial landscapes should be exciting and inviting, and we offer garden rejuvenations and complete landscape services to our fellow local businesses. 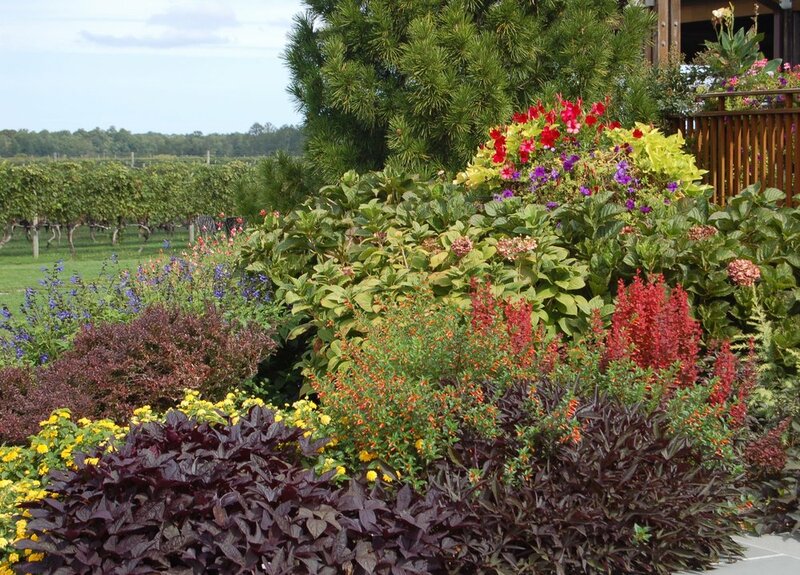 Most of the plantings used in our garden installations are grown at the nursery. We specialize in rare and unusual trees, shrubs, perennials and annuals, as well as the old favorites. Trimble’s is also committed to utilizing organic gardening practices. Not only do we grow our plants without dangerous chemicals, we also treat your property with the same respect...using organic, slow-release fertilizers, healthy mulches and soil amendments, and good cultural practices in pruning. This creates a safer environment for you, your family, pets and wildlife.